I sometimes wonder whether Umberto Eco’s legacy as a writer will largely ignore his fiction. Not, of course, The Name of the Rose, the novel which made Eco’s name as a result of both its popularity and skilful construction. Had it not been a success, though, would he have gone on to write more fiction, or retreated back into the academic world? Don’t misunderstand me: I enjoy Eco’s novels – they are frequently entertaining and learned – but none have quite matched his first, and, until The Prague Cemetery, seemed to be on a downward trajectory reaching its nadir in The Mysterious Flame of Queen Loana. Braggadocio attempts to convince Colonna that Mussolini survived the end of the Second World War; it was, in fact, his double who was killed. As Braggadocio has already conducted most of his research, this presented largely in dialogue, which Eco splits over more than one scene in an effort to create some tension. More plausibly, Braggadocio goes on to outline the use of ex-Fascists by the Americans to prevent European countries from straying towards socialism (this will be of interest to anyone who has read Peter Carey’s Amnesia which recounts an American plot to remove an Australian government they felt were too left wing). The novel raises the possibility that Colonna’s life may be in danger as a result of what Braggadocio has told him – it begins with Colonna fearing that this is then case in June before rewinding to April to tell the rest of the story in flashback. How seriously Eco intends us to take this is unclear: it is the fact that his water has been turned off which causes Colonna to panic, and, while panicking, he is able to summarise his life story up to that point for our benefit. How seriously we are to take the novel as a whole is also unclear. Obviously the newspaper satire is poking fun at Italian corruption, but is Eco also satirising conspiracy theorists? Or is he suggesting that the more ridiculous theory (Mussolini’s survival) merely symbolises the continued influence of Fascism on Italy? Though far from a perfect novel, Carey is clearly upset (okay, outraged) at the American coup in Amnesia; Numero Zero feels more like an intellectual game. (And this is without considering the least plausible aspect of the novel, the love affair which Eco inserts into the narrative). 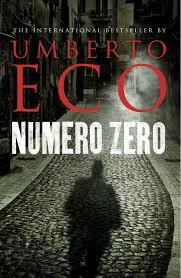 Numero Zero is short and entertaining, but the entertainment lies more is the conspiracies themselves than in the way they are presented in the novel. In turn they clash with the satirical intent, leaving this reader a little uncertain what to make of it all, a not atypical reaction to conspiracy theories themselves. You are currently browsing the archives for the Umberto Eco category.